Our three main goals are: Build a strong self-advocacy organization in Massachusetts, develop the resources to support the organization and take action on issues important to self-advocates in Massachusetts. We have an elected state Board of Directors that meets monthly at Brandeis University, monthly regional meetings across the state, as well as over 80 local self-advocacy groups state-wide. We advocate on issues with Mass Families Organizing for Change, ArcMass and other organizations. 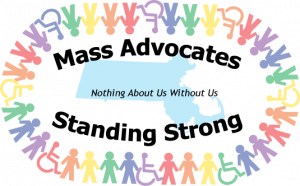 We provide trainings in partnership with others, such as Self Advocacy Leadership training with the Massachusetts Developmental Disabilities Council (MDDC), and self-advocacy training and support around the state. Cognitive and developmental challenges primarily. No fees, though we do have paid membership. No cost to self advocates.